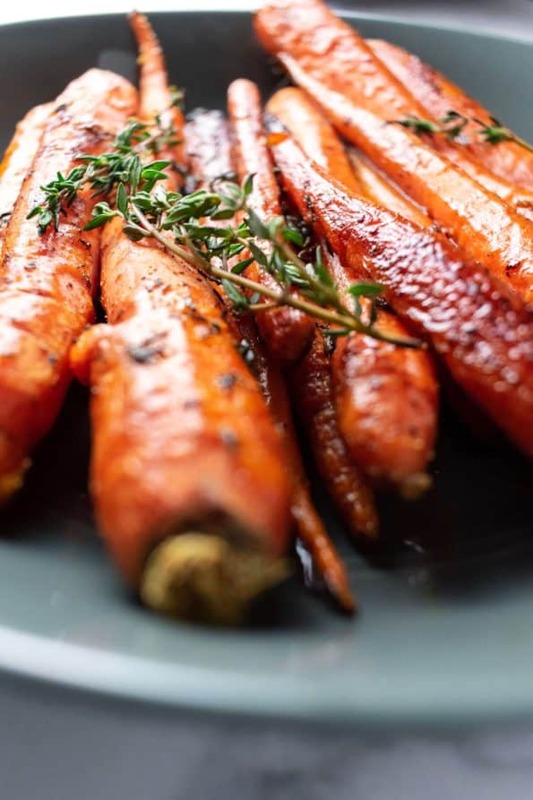 Brown Butter & Thyme Roasted Carrots is a simple approach to beautifully browned carrots with dramatic flavor of garlic, thyme, and deep brown butter. Throughout the holidays, side dishes are king. Primarily side dishes that are heavy or carb loaded, like mashed potatoes, mac and cheese, homemade biscuits, etc. Vegetables usually get picked up last – and aren’t typically the fan favorites, unless they’re somehow turned into a carb loaded dish or topped with sugar, re: green bean casserole & sweet potato casserole. I’m willing to bet this is because the way we’re making the vegetables lack flavor. 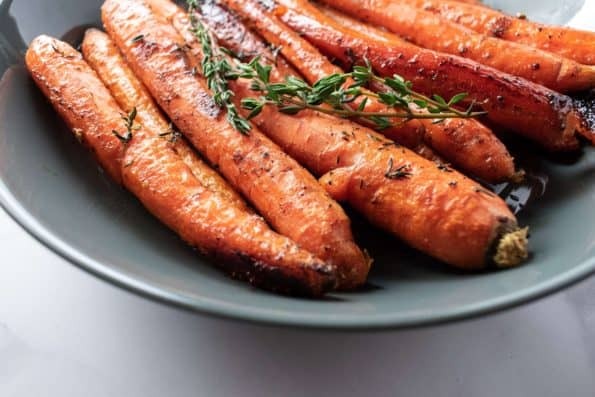 This recipe is perfect for the holidays or special occasion where you want to really punch up the flavor on regular old baked carrots & impress your guests. I’ve also made this recipe several times throughout the week because it’s just that simple! Brown butter gives anything it comes into contact with a nice nutty & salty flavor, while the garlic and thyme infuses the butter. 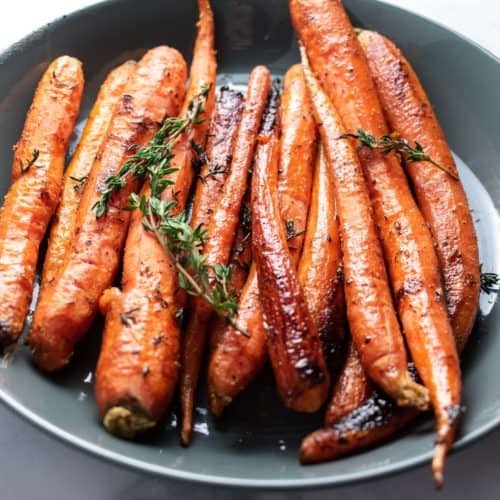 The carrots simply get tossed in this browned butter and are left to bake at a high temperature of 425 for 20 minutes and come out with their skins glistening and browning. Melt butter in a small pan over medium heat. Butter will become frothy and then start turning brown, stir occasionally. Don’t let it burn! Turn off the heat. Mix in the garlic cloves & thyme. Pour mixture all over carrots and toss to combine. Salt & pepper the carrots to taste. 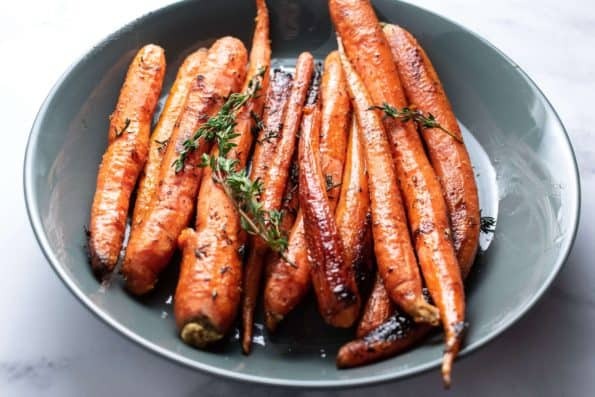 Bake for 25 minutes or until carrots start getting nice and browned on the outside.